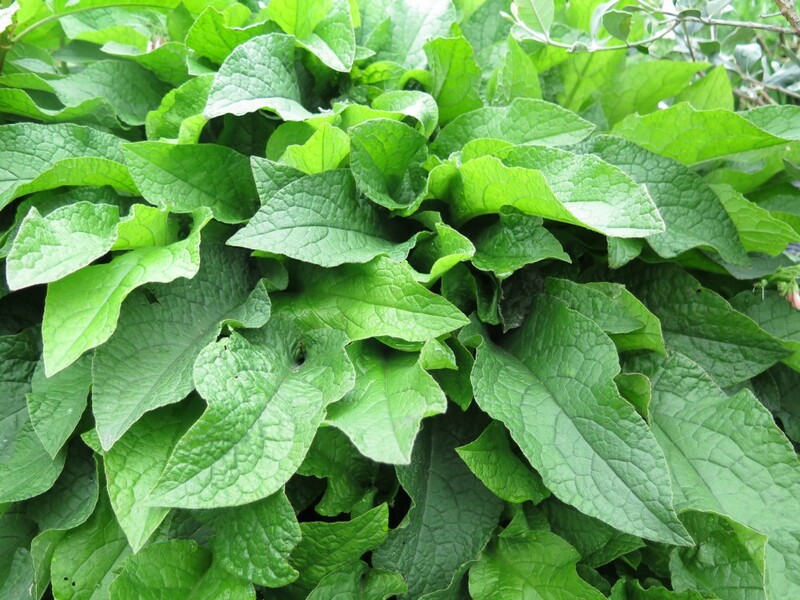 The official line on eating comfrey is that you should not eat it as it could cause you serious harm. I’m not even sure exactly what type of harm, but apparently it’s bad – or so some of the major medical companies say. So the following article is written based on personal experience and not as a recommendation. If concerned, you should go and talk with a professional medical health person before you go there. That’s my disclaimer. 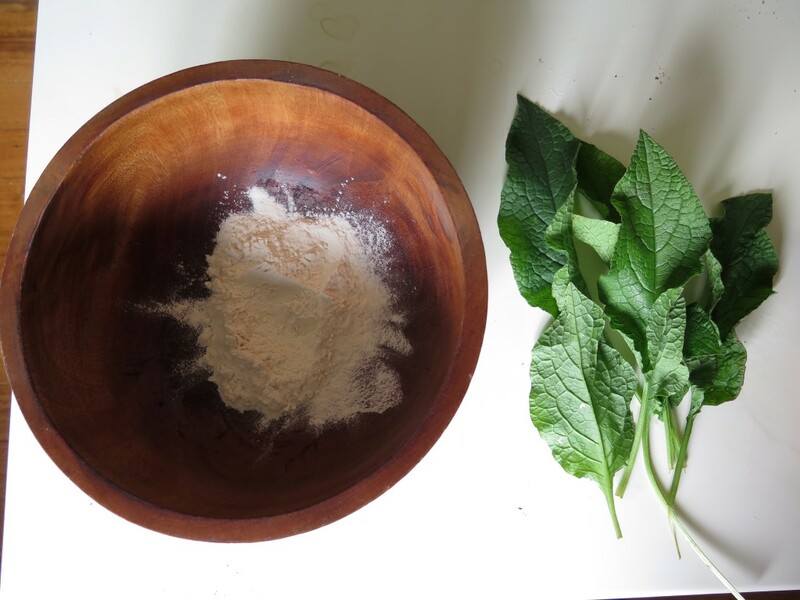 Now… Lets get into why I love eating comfrey and how! I grew up on a small herb farm where we ate lots of strange and unusual plants, including comfrey. Every time we were sick, our folks would make us the ‘green drink’ which was based on whizzed up dandelion and comfrey leaves and juiced carrots and apples. It was amazing how effective this brew was and while we didn’t exactly LOVE the drink at the time, it really did have some major health giving properties – like seriously. So when someone (I can’t actually remember who) showed me how to make comfrey fritters around 14 years ago, I was 200% into it. 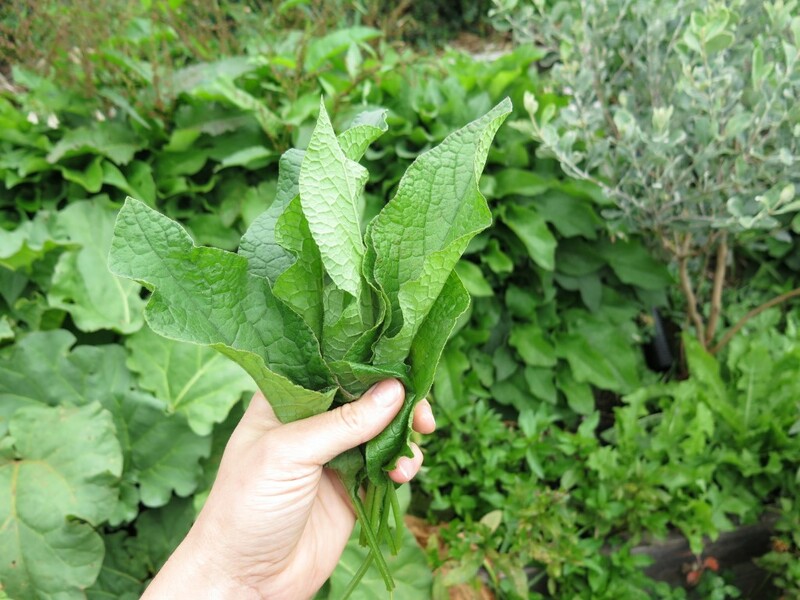 The comfrey I use is the Russian comfrey (Symphytum × uplandicum), which is the most common variety around. While it loves growing in well drained, friable soil – it can also thrive in steep, compact, crappy soils – like ours. Each winter it dies back and each summer it comes back bigger and better – our kind of plant. 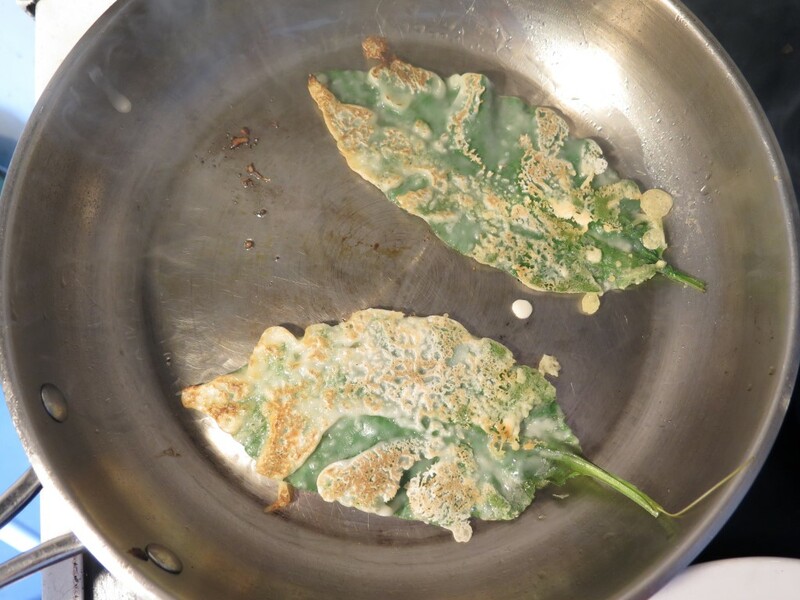 When I’m harvesting comfrey to make fritters I pick the small – medium sized leaves as they fit better into the fry pan, plus they’re nice and fresh. 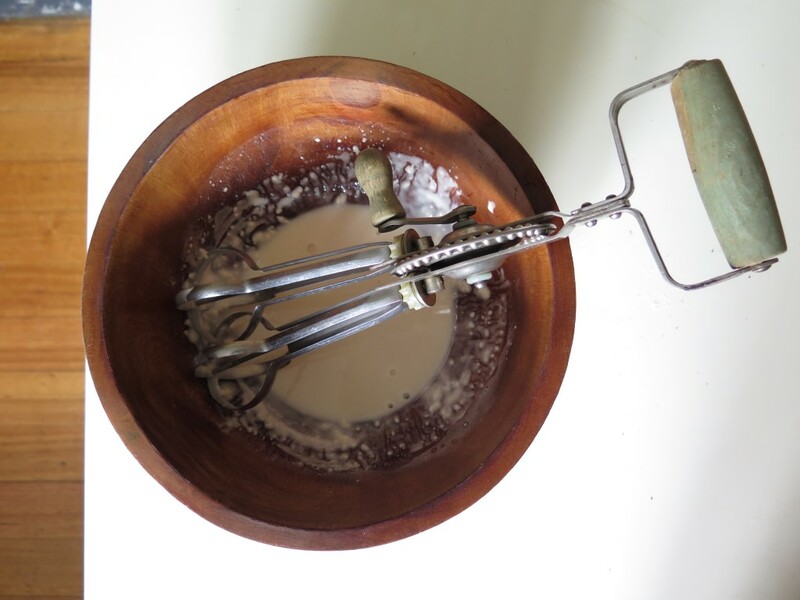 Using any type of flour you like, make a batter of flour and water. You can also add in some flavours such as salt, paprika or herbs to taste at this point to add some extra flair. 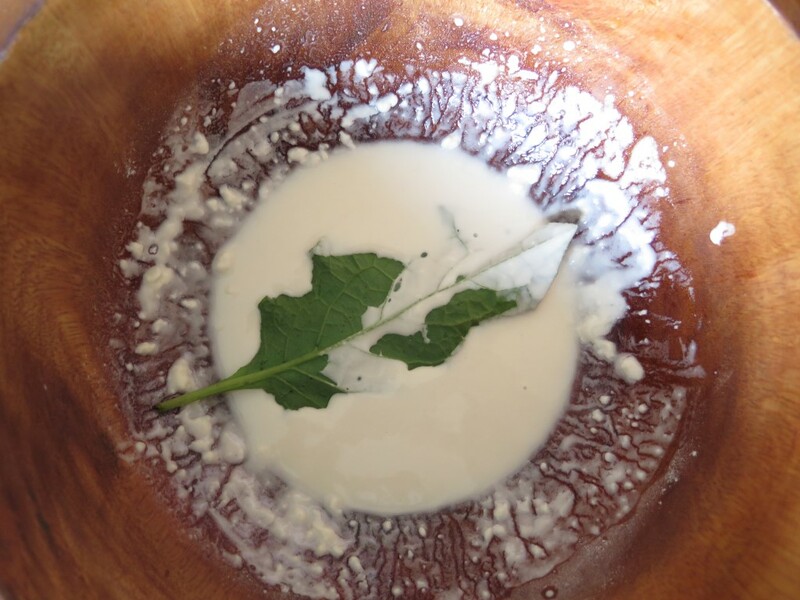 In terms of how much flour and water, just add water to your flour until you have a nice “slurry” – don’t make it too thick as you’ll end up eating dough – you want the comfrey leaf to shine through and dominate the culinary experience. 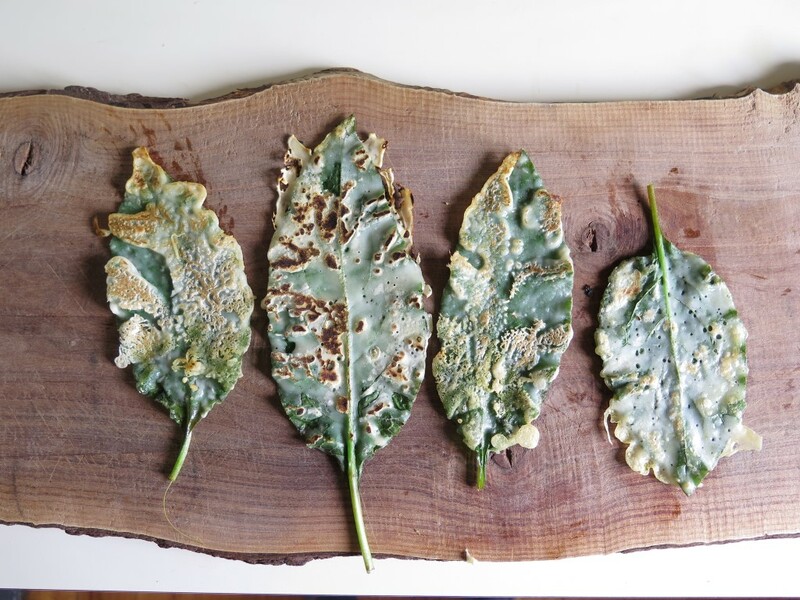 Dunk each leaf into your batter, making sure that there’s solid coverage of the batter over the whole leaf. Fry them up in some olive oil (or other oil if you prefer) in a hot pan for approximately 5 minutes or until they turn golden brown’ish. A good trick is to leave their little stems on as it makes it easy to turn them over and pick them up. And voila! They’re ready in no time at all – which is the best amount of time when cooking. You can eat them as they are or add them to a dinner of veggies, grains or anything that takes your fancy. 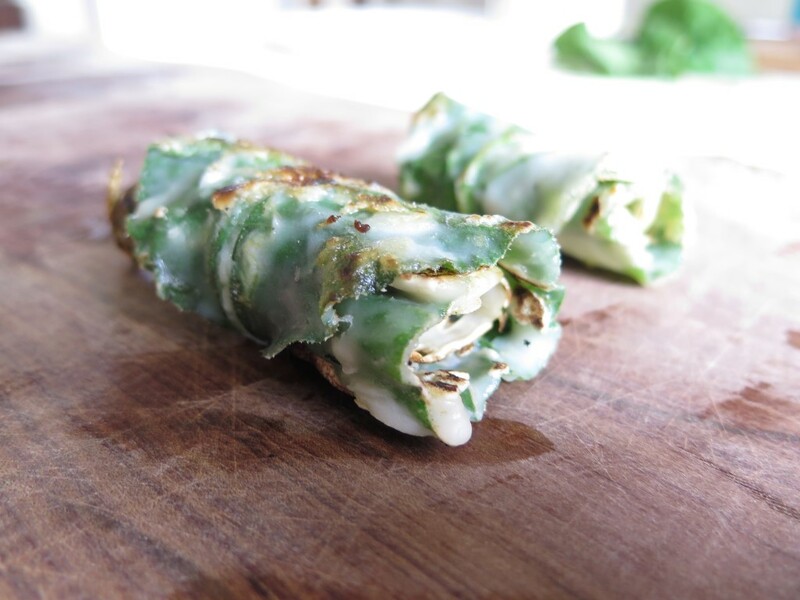 You can also get tricky and roll them up (as shown below) – this makes for easier eating, plus they look pretty. There’s also no reason why you couldn’t put some tasty morsels inside the rolls – I’m thinking kim chi, but it could be anything your heart (aka taste buds) desire. I’m a firm believer that eating broadly and freely is good for you, meaning it’s ok to eat outside the box (if that makes sense). Don’t get me wrong, you most definitely should not ONLY eat comfrey (or any other one thing), but I do think that most things in moderation is not only ok, but probably really good for you. Want to read more about comfrey? We learned about the chicken tunnel a few years back from our friends at Very Edible Gardens and have managed to squeeze it into every appropriate design for our clients and our own gardens ever since. It’s one of those life changing techniques you learn, and then wonder how you got through life before hand without it – it’s that good… Seriously. We recently did a design for a property with extensive food gardens backing onto a series of paddocks used for grazing animals. The grass was a significant issue in terms of maintenance and they had used round up to keep it under control, which we completely understand – no one wants to spend hours on the end of mattock weeding again and again and again. 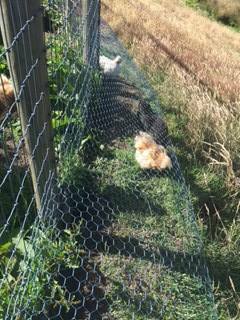 Thankfully this is where chickens can step up and do the job for us, and keep poisons out of the garden. A chicken tunnel built by some of our design clients in southern Tasmania recently. It has been built on the external side of their food gardens which back onto their paddocks used for grazing animals. There a a range of ways of building a chicken tunnel – we generally go for the simple options as they’re quick to build and 100% functional. We build something resembling the sketch on the right (in diagram below) and use chicken wire as the tunnel, tie wire to connect it to the boundary fence (or nails if the fence is timber) and some type of landscaping peg to secure it to the ground. You can use tent pegs if you have an abundance of them, but they tend to pop out as they’re too small. I’ve also made my own pegs out of strong high tensile wire used for fencing. 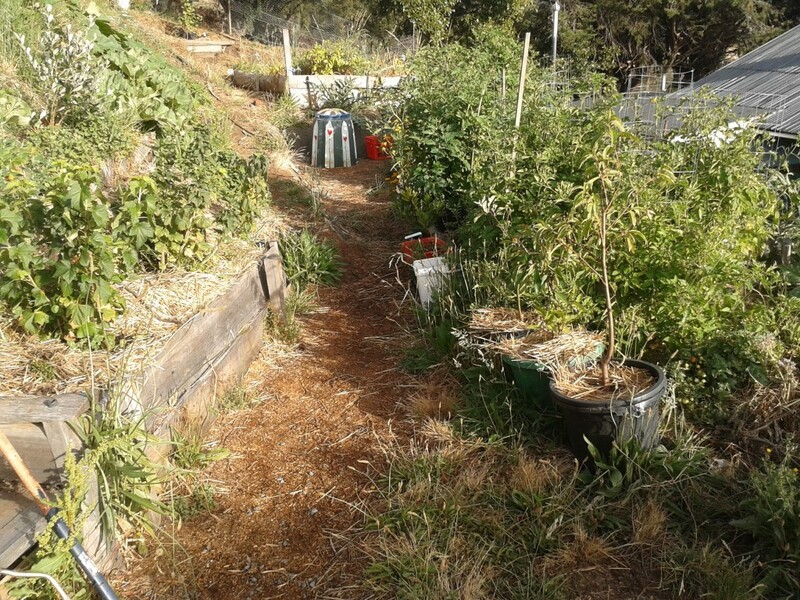 For this particular design, we worked with the existing fence line and integrated a chicken tunnel along all relevant edges, turning a negative (weedy grasses) into a positive (food for chickens). You’ll notice, in the diagram below, we have different coloured sections, this indicates how it’s possible to rotate between sections so the chickens are never permanently grazing one area only. It’s important to be able to provide different and fresh ground for your animals to keep them healthy. 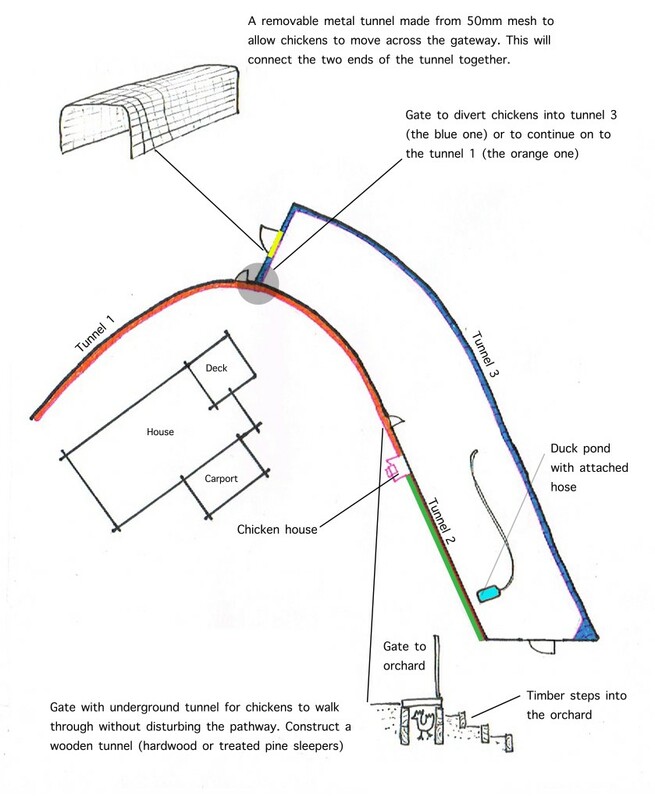 Another example is from our last rental home where we made a much small chicken tunnel to create two runs for our chooks which we could then alternate them between. We also made the tunnel function as a seat for us to sit around a camp fire (which hadn’t been created yet in the photo below). So this particular tunnel is one of my favourites due to being so multifunctional. As this tunnel was up against a concrete wall, preventing weeds from creeping in wasn’t its main job. Instead, it’s key function was to pipe the chickens across the yard without taking up too much space – essentially doubling the area available for our chickens, increasing their health and happiness. 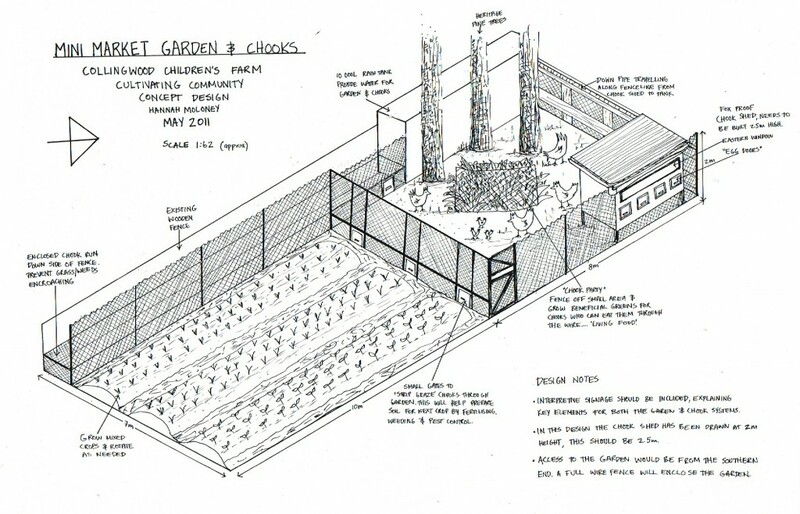 Finally, a concept sketch I did back in 2011 (and which wasn’t actually ever implemented) for a project is seen below where a chicken tunnel is integrated into a mini market garden to prevent grass from creeping in from the boundary fence line. For such a simple thing the impact is ever-giving and wonderful, no matter how small it can literally save you from many hours of weeding. Do you need to train the chickens to walk into the tunnel? We’ve found that food works wonders in enticing the chickens in to the tunnel the first one or two times. After that they quickly work out that the tunnel = a world of fresh food and newness, so they learn super quick. Want to see more chicken tunnel magic? 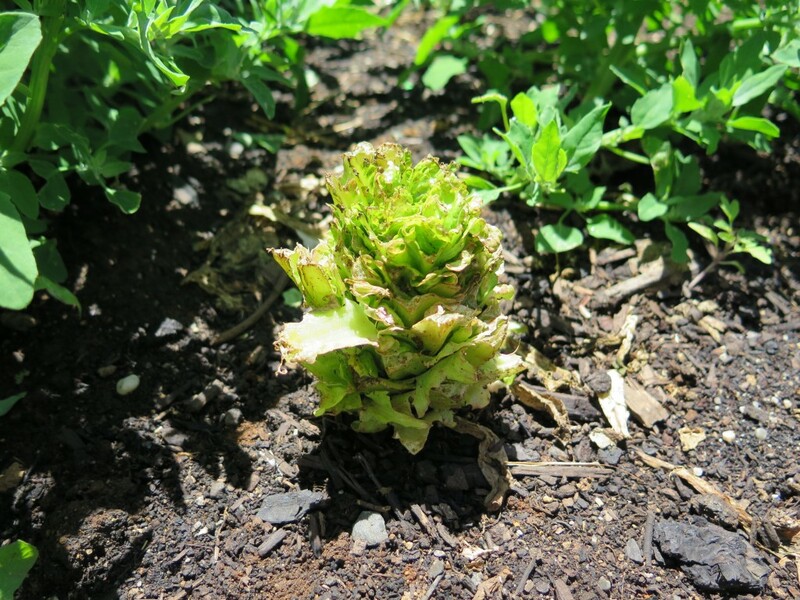 Check out this fantastic blog by Very Edible Gardens blog here. And here she is. 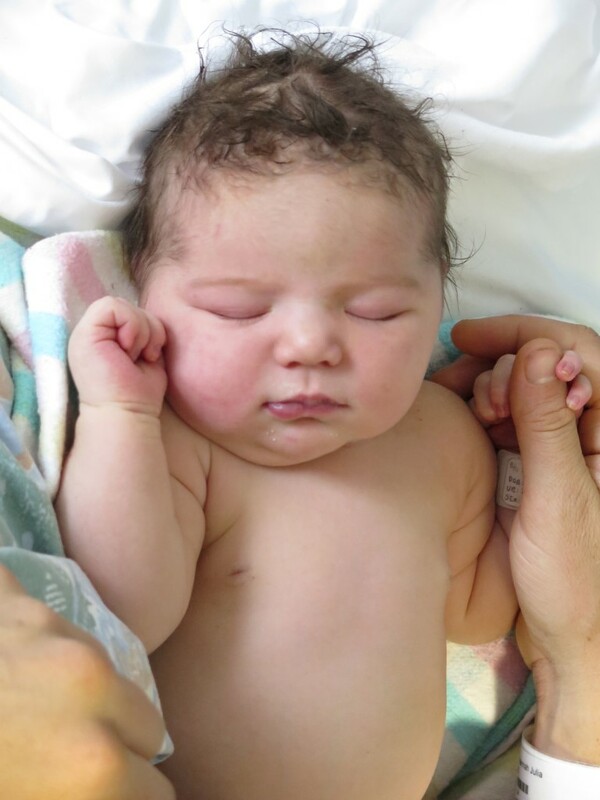 Our little baby girl, Frida Maria Vikstrom, who isn’t actually so little, weighing 4.9kg (10 pounds, 13 ounces) and being 57cm long. Rather impressively large hands, feet and belly…. And a gentle, gorgeous vibe which has claimed our hearts and gotten us all stuck for words. But in summary, we’re overwhelmed with the specialness of these precious moments. 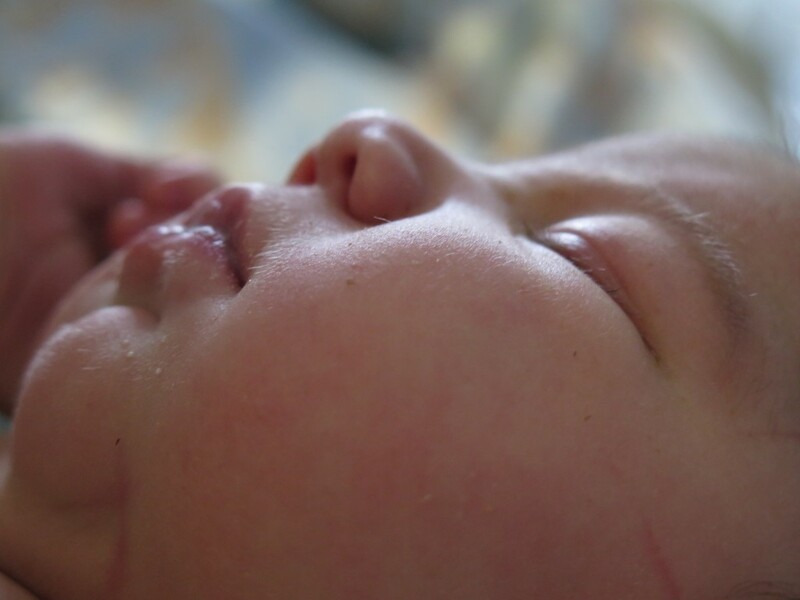 So to make the most of them – to fully savor them, we’re taking some time off work for the next month’ish while we immerse ourselves in our new housemate and learn her ways. We’ll go a bit quiet on this blog – however, we will be back in force and of course you can still reach us through email with any questions though, so don’t be strangers. 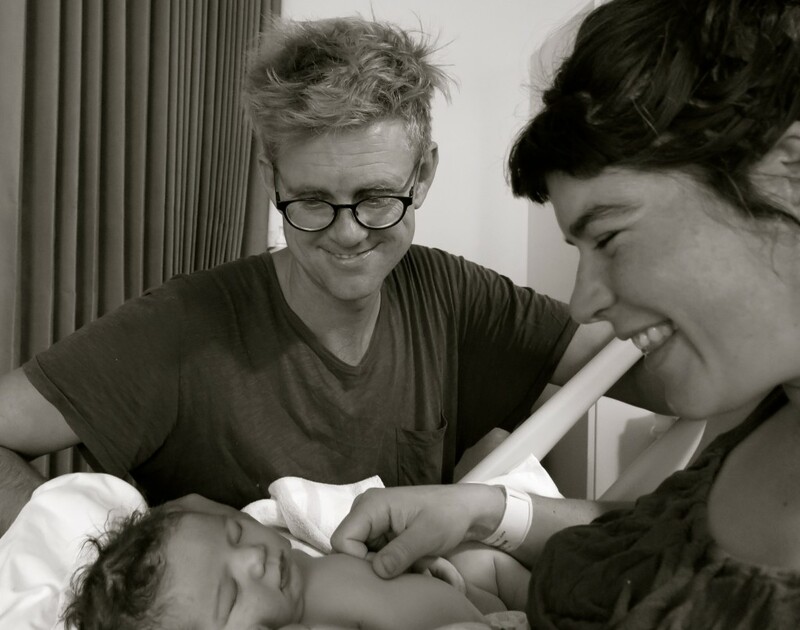 Here’s to new life and new love x x x.
There’s an acronym, W.A.S.P.A, which is really popular in permaculture circles. It stands for Water, Access. Structures, Plants and Animals and lays out the order in which you should implement your design for ultimate ease and flow. Let me step you through the thinking and considerations…. And then confess a bit of a stuff up on our behalf when implementing our our design (an ongoing process). Implementing water first up can include large scale earth works (i.e. dams and keyline systems) where you have big machinery coming through your property, you can see our own earth works we’ve completed here. As we’re on an urban block there are no dams, buts lots of terracing, and passive water harvesting systems, including swale paths. You really don’t want to be trying to do this work once you have other things in place i.e. fencing, as you’ll end up having to rip it out and put it back again, a whole world of pain which is best to avoid. Of course, water systems can be happen on a much smaller scale and involve installing taps, drip line irrigation (something we’re still planning to do), rain tanks or simply digging a trench with a mattock and shovel to direct water flow. Regardless of scale, it’s best to get this all sorted first up so you can then support what’s to come – cause lets face it folks – water is life. No water no life. A snapshot of the major earthworks we did on our place within a month of arriving. The blue lines indicate where the key access paths/swale paths are now located. Access is super important and determines how you move around the site on foot, with your wheelbarrow, on your tractor or car. If you get it right, good access paths can improve efficiency drastically as well as double up with water harvesting systems. Implementing access paths can often happen at the same time, or very closely after water systems are put in place. When working with large machinery, you can double up by carving in water harvesting methods and access roads/paths at the same time – this is what we did with our swale paths (below) and it’s working a treat. Structures can include tool/machinery sheds, fencing, animals shelters and your house (if building from scratch). At our own property there was an existing house (yay) with a downstairs space which currently functions are our workshop/tool shed. We do plan to build a glass house, however this is lower on our priority list compared to other structures such as fencing (which still isn’t 100% complete) and animals shelters such as our rather beautiful chook house. Without a doubt the floppy fence is my favourite structure on our place, it allows us to grow and harvest crops without feeding all the local wildlife. Well worth the investment in time, money and energy. Now, and only now, should you be looking to plant vegetation – edibles and otherwise. In our area, if you plant your crops before you have put your fencing up you might as well declare your garden a wallaby, possum and rabbit feast – they’ll be in there before you can say ‘bugger bugger bugger’. Your plants will also benefit massively from having good water systems set up and access paths for easy harvesting and maintenance. It all fits together beautifully. The first plants we put in was a stack of annual green manures to improve the soil which we’re still as the soil needs a lot of love. This particular growing season it turns out we’re growing 50:50 of vegies and green manures which we’ll do into winter as well as we’re thinking long term here. We’ve had some bumper crops in our 2 years of being here, none of which could have happened without our water, access and structure systems in place (photo from October 2014). Last, but not least – animals enter the system. For animals to thrive and not just survive they need a space which is well suited to their needs, otherwise it’s simply not ethical or appropriate to have them in there at all. We have chickens, ducks and honey bees at our own property. 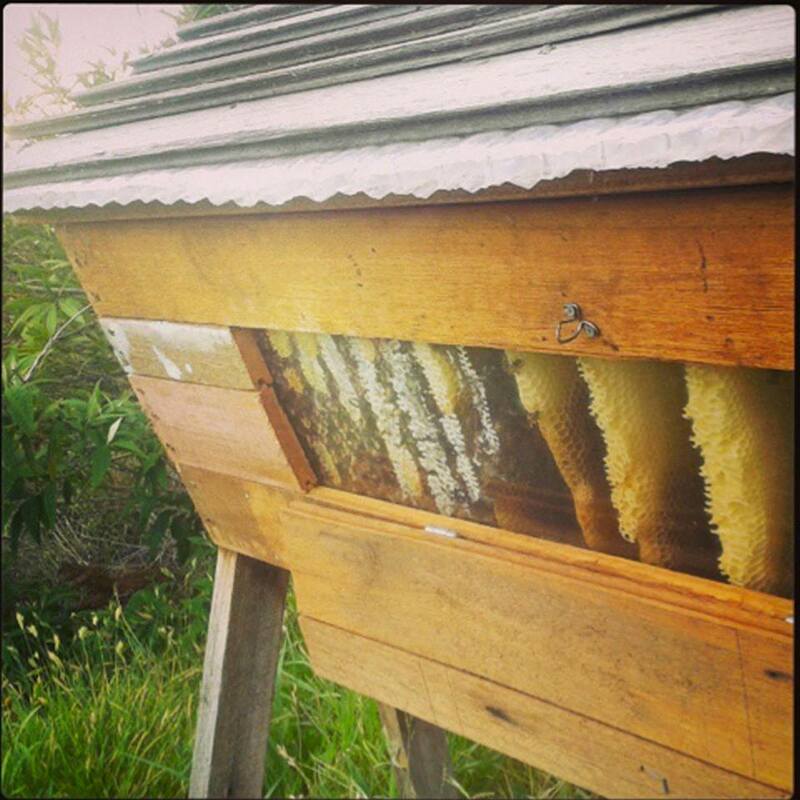 The bees are beautiful and happy in their top bar bee hive (above). Our chickens have what we call the ‘stage one’ run which is more than enough space with good shelter – we’re actually going to be extending and integrating them more into our food gardens this year. But it’s still a good, healthy space for them right now. And our ducks.? Well now this is where we smack ourselves on the wrists. Our ducks were always in our design, but we weren’t planning on getting them as soon as we did. The idea was that we’d simply have two female ducks for egg production and slug control and that would be that. However – just over a year ago I happened to be in the vicinity of a bunch of cute-as fluffy ducklings and I wanted them right then and there – there was nothing more to it. So, despite not having a home or a pond set up for them, four ducklings came home with me. I chose four as I thought that at least two of them would be girls and the boys could be re-homed or eaten. I was told they were pure khaki campbells which are good breed as they don’t fly, are quiet, don’t destroy your crops so can free range in the vegie patch and are great egg layers. However, a few things happened… It turned out they weren’t pure bred khaki campbells, but ‘bitzers’ as in a bit of this and a bit of that, so they liked to fly and eventually some did… Away from us. The ones that stayed turned out to be boys, bugger – and four was simply too many to have, even for a short while in our urban space. So we sorted out the numbers, bought in a pure bred lady khaki campbell and had some baby ducks with the intention of just keeping 2 girls. 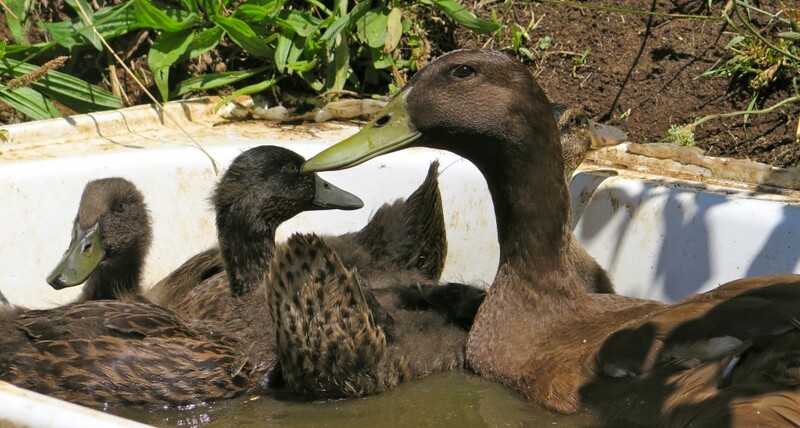 Today we have 5 ducks (2 adults, 3 teenagers) and a simple but great pond/fertigation system which is tops. However 5 is too many for our space, for the first time they’ve started eating our crops, specifically all our lettuces which is not ok. With just two ducks it was fine, they happily free ranged throughout our garden and had a little nibble here and there, but the increased numbers means there’s more hunger and more stress on our system, which we simply can’t support right now. Exhibit A – the lettuces (and nothing else) have been getting hammered. And this is where we come back to W.A.S.P.A… If we had followed this to the book our ducks would still be another year away and our lettuces would still be here. We need more time to finish installing the needed structures and plant systems which would support the ducks and us. But real life doesn’t always work like that, we’re an impulsive lot us humans and no matter how much we learn we will more often than not regress to instinctual ‘wants’. We’ve just made the decision to re-home our little duck family at a friend’s house and use this next year to complete some of our foundational structures before the ducks can come back, cause they’ll definitely be back. This means we want have to work as hard to have them here, and we all know that permaculture is all about with nature rather than for or against it. We’re looking at it as a good and humbling reality check. A healthy reminder that we must always self regulate and admit when you may have got ahead of yourself. 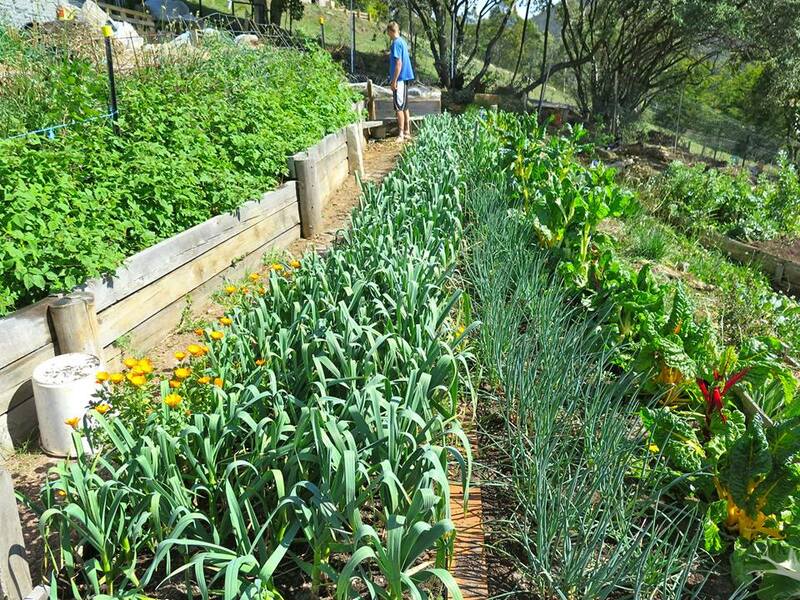 The great, fantastic thing about permaculture is the design framework – this is what sets it apart from other methodologies and gives it huge strength. It’s this framework that keeps us in check and provides a clear tool for us to use when we pause and reflect on the work we have done so far and are yet to do. So here’s to learning, stuffing up, and learning some more. A non-stop ever evolving process!